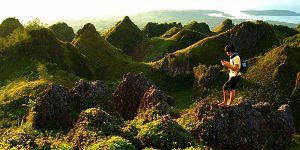 I was in Manila last week and I was searching for backpacker lodges in the area since my friend’s place (where I normally crash) was unavailable. 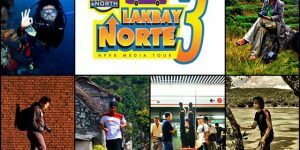 I was planning to stay in backpacker hostels in Malate but I found it a bit far from the metro. Good thing I was referred by Dong Ho to Our Melting Pot (OMP) hostel in Makati, Philippines. I didn’t expect much from this place. All I wanted was a decent bed to crash plus good WiFi connection to work on my online assignments. I got more than what I asked for when I spent the remaining days in this awesome backpacker inn. 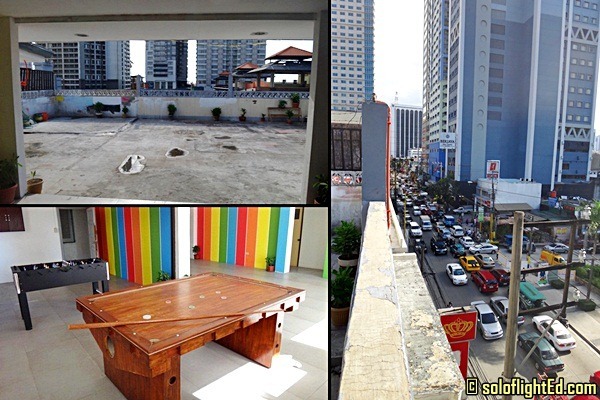 Our Melting Pot is located in what seems like an abandoned building in Makati Avenue. The elevator was a little creepy at first, but I got used to it. On the 4th floor, I removed my shoes and went inside. I was welcomed by a spacious common area where the staff was already expecting me. I was led to my bed in the dorm room for six people. The bed was clean and big and it had a curtain which is great especially when you want some privacy as you sleep. The communal bathroom had a number of shower and toilet cubicles. Note: This is most basic room type that I took. For those looking for more than a dorm-type room, they have other accommodations available. They have a 4-bed Mixed dorm room for 800 Pesos (around 18 USD) , 4-bed Female dorm room for 850 Pesos (around 19 USD), private ensuites, etc. 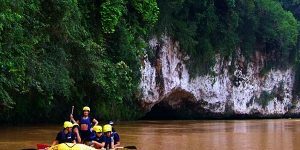 Do check their website and book in advance to ensure room availability. 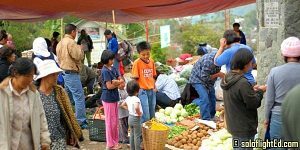 Our Melting Pot hostel is readily accessible to food shops and supermarket stores below so finding a place to eat and buying stuff aren’t that difficult. It’s only a few minutes away from malls such as Greenbelt and Glorietta, too. A great spot to chill out aside from the common area is the rooftop. It was nice to get a view of the towers surrounding Makati Avenue. They also have a game room for those who want to play fussball or pool. It’s still unfinished and I heard they’re setting up a coffee shop soon. One morning, I went out for some air and decided to do some stretching. It’s been awhile since I worked up a sweat. 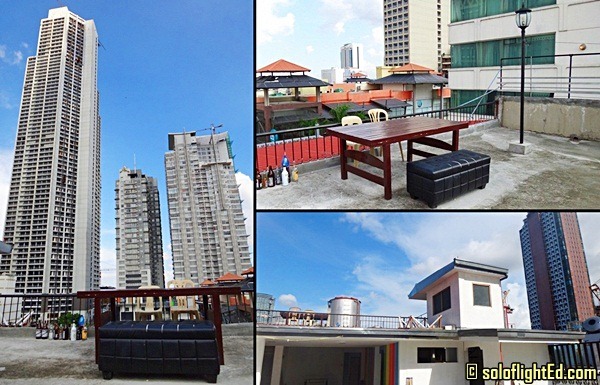 The rooftop is also a great place to relax for those who want to grab a few bottles while admiring the view of the sky and the skyscrapers. I would’ve wanted to be there when the sun would already set, but maybe some other time. One of the things that I’m particular about when it comes to value for my money is the service that a business brings to its clients. The staff was more than helpful in answering my questions and they’re more than willing to assist you when you want to go to a particular place. 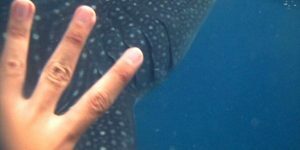 They were very friendly. I remember one of them introducing me to other hostel guests. I didn’t have any plans of talking as I was focused on doing online work. However, I ended up chatting with the staff and other travellers. This was a nice treat and I realized that the people behind OMP want to foster a community of travellers. It’s not just about the accommodation. When I checked out from the hostel, I needed to kill time for a few hours before a meet-up I was attending. Instead of going to a coffee shop, I asked the staff if they could let me stay in the common area and use their WiFi. They said yes without any hesitation. One of the things that I looked forward to during my stay in OMP was the breakfast! 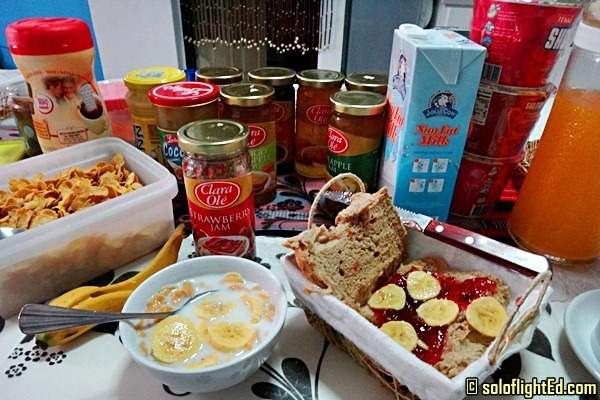 Cereals, oatmeal, assorted fruit jams, coffee, fresh milk, powdered milk, powdered chocolate drink, tea, orange juice, cup noodles, wheat bread, sandwich spreads and even a banana! There were so many that I was overwhelmed by the choices available. They labeled the breakfast as “modest” but it was truly generous. The best part was that it’s free! 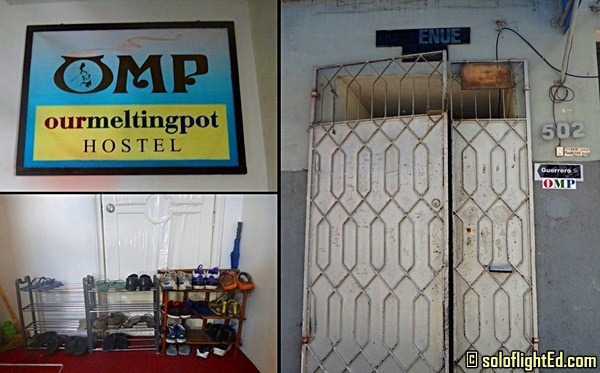 Not sure if this is a great hostel review but if you’re looking for a budget place to stay in Manila, I suggest you check out Our Melting Pot in Makati Avenue. By the way, this is not a sponsored post. I can’t help but recommend this place to others. 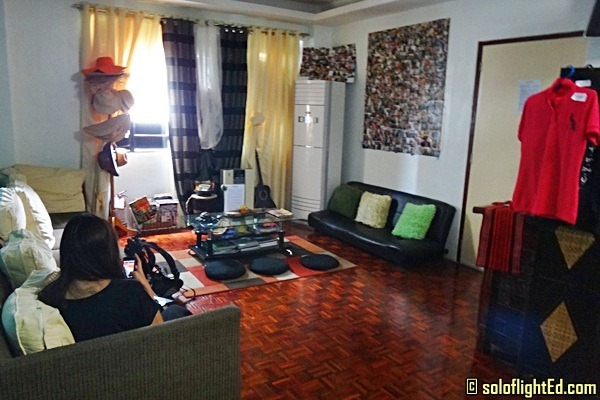 Thanks to Dong Ho for sharing this beautiful abode in this busy district! Never thought meron palang mga hostel dito sa makati. For 600 may breakfast na, sulit na sulit . Me too, I never thought of this place in the heart of a busy street, ang cool lang… Thanks for sharing and I agree that it's a big factor for me if the staff are accommodating. Plus the breakfast! Really worth it! @jerome: haha, kaya nga ayokong lumabas ng hostel. haha! @killerfillers: yep, and I didn't have to go out and stay in a cafe to work. I could just work there! sulit talaga yung breakfast! @nathalie: Hi Nath, yep, mixed dorms for 600 pesos, they also have female dorms for 850 pesos. Kinikilig ako sa brekkie spread! @gayE: hahaha, sarap balikan kahit sa breakfast lang! 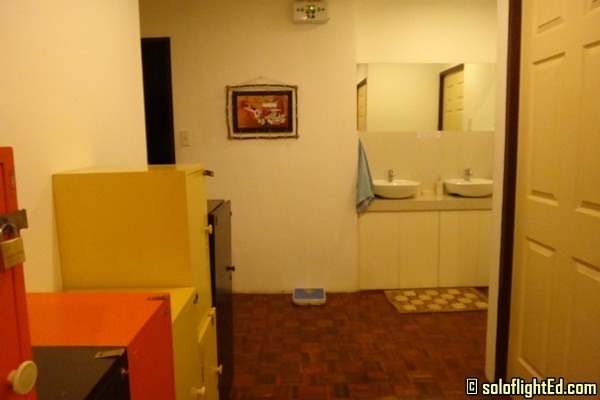 Nice place ^_^ sana pala dito na lang kayo sa condo unit namin nag-stay, libre pa! w/ swiming pool. LOL hehehehe..
@marky: yep, sarap bumalik dun kinsa doc Deo. haha! okay ah! haha. sulit ang P600! Heard of this before but never thought na ganito sya ka okay, free breakfast pa. Sulit na sulit. I hope magkaroon ng madami pang backpacker's lodge or hostel sa Metro Manila so to lure in more tourist. I guess yun ang kulang dito, cheap accommodation. Puro hotel na kasi! Looks like this is a really good place to stay! safe ra didto bai? naa nakoy option, way cheaper 🙂 thanks for sharing! @brenna: daan ka dyan one of these days brenna! 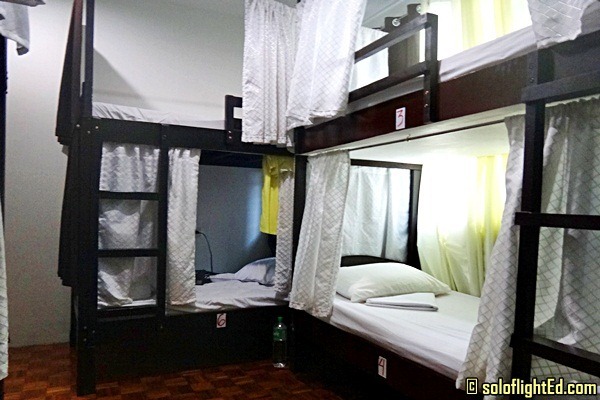 Sus may nag e exist pala sa Makati area na ganto ka affordable na hostel. Sana dito kami lagi ng loveones ko esp. my BF. Makapag photo op nga ng bonggang bongga jan sa rooftop! At ang bfast meal. ang tarush! I Hope mas dadami pa Hostel or Guest Houses sa Pinas. 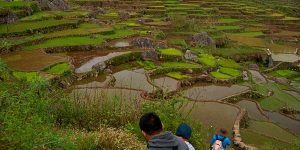 Isa yan sa factor why Backpackers steer away in PHL because of hefty cash to spend just for accommodation. Thanks Eds for sharing this. Though 600 pesos is expensive but I think it's worth it if you're staying in Makati + nice view + Uber sa dami na breakfast. ang lapit sa office. dapat pala niransak (meaning: gate crash na may halong pagnanakaw ng pagkain) ko ang hostel niyo nung nandun ka pa. Sayang! free bfast + free wifi ! = sulit! @hana banana: sulit sya talaga and the location too!